Mauna ʻAla (Fragrant Hills) in the Hawaiian language, is the Royal Mausoleum of Hawaii (also called Royal Mausoleum State Monument) and the final resting place of Hawaii's two prominent royal families: the Kamehameha Dynasty and the Kalākaua Dynasty. In the early 19th century, the area near an ancient burial site was known as Pohukaina. It is believed to be the name of a chief (sometimes spelled Pahukaina) who according to legend chose a cave in Kanehoalani in the Koʻolau Range for his resting place. The land belonged to Kekauluohi, who later ruled as Kuhina Nui, as part of her birthright. After 1825, the first Western-style royal tomb was constructed for the bodies of King Kamehameha II and his queen Kamāmalu near the current ʻIolani Palace. They were buried on August 23, 1825. The idea was heavily influenced by the tombs at Westminster Abbey during Kamehameha II's trip to London. The mausoleum was a small house made of coral blocks with a thatched roof. It had no windows, and it was the duty of two chiefs to guard the iron-locked koa door day and night. No one was allowed to enter the vault except for burials or Memorial Day, a Hawaiian holiday celebrated on December 30. Over time, as more bodies were added, the small vault became crowded, so other chiefs and retainers were buried in unmarked graves nearby. In 1865 a selected 20 coffins were removed to a Royal Mausoleum named Mauna ʻAla in Nuʻuanu Valley. But many chiefs remain on the site including: Keaweʻīkekahialiʻiokamoku, Kalaniopuu, Chiefess Kapiolani, and Timothy Haalilio. The 2.7 acre (11,000 m2) mausoleum was designed by architect Theodore Heuck. King Kamehameha IV and Queen Emma planned it as a burial site for their families. However, the first to be interred was their four-year-old son, Prince Albert, who died August 27, 1862. King Kamehameha IV became ill soon afterwards and died November 30, 1863, just 15 months after his son. His brother Lot Kamehameha came to the throne as King Kamehameha V.
Immediately Kamehameha V started construction of the mausoleum building. The Right Reverend Thomas Nettleship Staley, first Anglican Bishop of Honolulu (1823–1898), oversaw construction. The west ('Ewa) wing was completed at the end of January 1864. A large funeral procession February 3, 1864, brought the body of Kamehameha IV from ʻIolani Palace near Kawaiahaʻo Church. His casket was placed on a stand in the new wing. Later in the evening, bearers brought the casket of Ka Haku o Hawai'i (as Prince Albert was known) and laid him to rest alongside his father. Queen Emma was so overcome with grief that she camped on the grounds of Mauna ʻAla, and slept in the mausoleum. The mausoleum was completed in 1865, adjacent to the public 1844 Oahu Cemetery. The mausoleum seemed a fitting place to bury other past monarchs of the Kingdom of Hawaii and their families. The remains were transferred in a solemn ceremony leading from the burial vault called Pohukaina at ʻIolani Palace to the Nuʻuanu Valley October 30, 1865. Robert Crichton Wyllie, Minister of Foreign Affairs, was buried here in October 1865. Over time, the remains of almost all of Hawaii's monarchs, their consorts, and various princes and princesses would rest at the Royal Mausoleum. Kamehameha I and William Charles Lunalilo are the only two kings not resting at the mausoleum. William Charles Lunalilo, the shortest-reigning Hawaiian monarch, (one year and 25 days only), was buried in a church cemetery resting in the courtyard of Kawaiahaʻo Church. Princess Nāhiʻenaʻena and Queen Keōpūolani are buried on Maui at Waiola Church. Kamehameha I's remains were hidden in a traditional practice to preserve the mana (power) of the aliʻi at the time of the Hawaiian religion. For several generations, descendants of Hoʻolulu, one of the few chosen to help bury the remains of Kamehameha, have been appointed as caretakers. 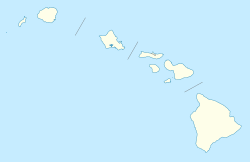 Mauna ʻAla was removed from the public lands of the United States by a joint resolution of Congress in 1900, two years after the Annexation in 1898 of Hawaii Territories by President William McKinley. The Mausoleum is one of the only places in Hawaii where the flag of Hawaii can officially fly alone without the American flag; the other two places are ʻIolani Palace and the Puʻukoholā Heiau. June 24, 1910, the caskets from the Kalākaua family were moved to an underground vault excavated from rock. In 1922 the main building was converted to a chapel, and the royal remains were moved to tombs constructed on the grounds. The chapel was added to the National Register of Historic Places August 7, 1972. High Chiefess Maria Beckley Kahea was kahu from 1893 to 1909. She was the first of the Hoʻolulu line to serve this position, a role which the family still holds today. ^ a b c d Kaiheʻekai Maiʻoho, William John (2003). "Nuʻuanu, Oʻahu - Memories: Mauna ʻAla". Pacific Worlds & Associates. Retrieved 2009-12-08. ^ "Ka Hoihoi Ia Ana O Na Kino Kupapau O Na Alii I Make Mua Ma Ka Ilina Hou O Na Alii". Ka Nupepa Kuokoa. IV (44). November 4, 1865. p. 2. Retrieved October 7, 2016. ^ a b Riconda, Dorothy (November 15, 1971). 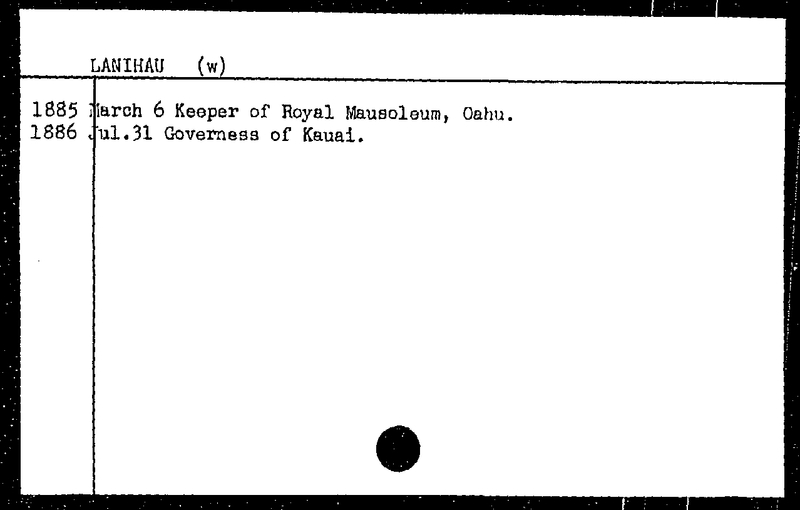 "The Royal Mausoleum nomination form". National Register of Historic Places. National Park Service. Retrieved 2009-10-13. ^ Apgar, Sally (March 5, 2006). "Mai'ohos feel drawn to royal burial site Six generations have cared for the Nuuanu mausoleum for Hawaii's kings". Honolulu Star-Bulletin. ^ David, Mari-Ela (July 22, 2009). "The Royal Mausoleum, the sacred resting place of Hawaii's Alii". KHNL News. Retrieved 2014-12-22. ^ Thrum, Thomas G. (1911). "New Kalakaua Dynasty Tomb". All about Hawaii: The recognized book of authentic information on Hawaii. Honolulu Star-Bulletin. ^ Parker, David "Kawika" (2008). "Crypts of the Ali`i The Last Refuge of the Hawaiian Royalty". Tales of Our Hawaiʻi (PDF). Honolulu: Alu Like, Inc. p. 55. OCLC 309392477. Archived from the original (PDF) on November 11, 2013. ^ Apgar, Sally (March 5, 2006). "Mai'ohos feel drawn to royal burial site - Six generations have cared for the Nuuanu mausoleum for Hawaii's kings". Honolulu Star Bulletin. Retrieved June 5, 2014. ^ a b Kaeo, Peter; Queen Emma (1976). Korn, Alfons L. (ed.). News from Molokai, Letters Between Peter Kaeo & Queen Emma, 1873–1876. Honolulu: The University Press of Hawaii. p. 14. ISBN 978-0-8248-0399-5. ^ "Na Nu Hou Hawaii". Ko Hawaii Paeaina. VIII (10). Honolulu. March 7, 1885. p. 2. ^ "Lanihau (w) office record". state archives digital collections. state of Hawaii. Archived from the original on March 4, 2016. Retrieved June 17, 2014. ^ Star-Advertiser staff (February 11, 2015). "Hawaii's Royal Mausoleum curator dies". staradvertiser.com. Honolulu Star Advertiser. Retrieved 9 May 2015. ^ Star-Advertiser staff (October 22, 2015). "New curator serving at Oahu's royal mausoleum". staradvertiser.com. Honolulu Star Advertiser. Retrieved December 14, 2015. D. Thor Minnick (2002). "Mauna'ala:The Royal Mausoleum, Nu'uanu Valley, Oahu, Hawai'i". Minnick Associates. Retrieved 2009-10-13. This page was last edited on 22 April 2019, at 14:56 (UTC).